Artist Francis Tsai was diagnosed with ALS in 2010. When the disease took the use of his arms, he drew with his feet on a touchscreen. Then he lost control of his feet, but it didn’t stop his art. He used eye-tracking software to continue creating. The oculomotor neurons controlling the movement of the eyes are among a highly select group that the neurodegenerative disease rarely touches, allowing many people with ALS to continue communicating with eye-tracking devices. Motor neurons regulating bladder and bowel control are also highly resistant. And, the motor neurons controlling slow-twitch muscles, used to stand or sit up straight, remain functional longer than those for sprinting or jumping (Pun et al., 2006). What’s special about these neurons? And do they offer clues as to how to protect or rescue the vulnerable ones? “What the motor neuron wants is a growth factor,” said Eva Hedlund of the Karolinska Institute in Solna, Sweden. These substances support the neurons, and help them keep connected to muscles at least in part by sprouting new axons (Azzouz et al., 2004; Storkebaum et al., 2005; Kaspar et al., 2003). Two recent studies of oculomotor neurons further support that idea, finding that neutrotrophin-3 and VEGF may be part of these ALS-resistant neurons’ secret sauce (Silva-Hucha et al., 2017; Hernández et al., 2017). Whatever makes these neurons unique, their resistance to ALS is striking, yet in rare cases, not insurmountable. In one case study, a patient in Japan who lived for 13 years with ALS, including 3 years on a respirator, experienced weakening of the eye muscles (Mizutani et al., 1990). Tsai, late in the course of his disease, nearly lost his ability to draw with his eyes. He died in 2015. “I think what we have is a spectrum of vulnerability,” said Krista Spiller, a postdoctoral fellow at the University of Pennsylvania Perelman School of Medicine in Philadelphia. A University of Seville, Spain, research team, led by Beatriz Benítez-Temiño, Sara Morcuende, and Ángel Pastor, reported their growth factor analysis in adult rats on July 11 in Frontiers in Neuroscience. They found that about 90% of oculomotor neurons produced BDNF and NTF-3. In contrast, ALS-sensitive motor neurons that control the movement of the face, originating nearby in the brainstem, produced only BDNF. (Hernández et al., 2017). And, neither of these substances could be detected in the motor neurons innervating the tongue. The Eyes Have It. Oculomotor neurons (red) contain the neurotrophic factors (green) BDNF and neurotrophin-3, but not nerve growth factor (NGF). [Courtesy of Hernández et al., 2017 under a CC BY license]. In another study, published June 1 in PLoS ONE, the researchers found high levels of both VEGF and its receptor in oculomotor neurons, which may help protect them from glutamate-induced excitotoxicity (Silva-Hucha et al., 2017). The presence of neurotrophin-3 and increased VEGF in oculomotor neurons adds to a long list of factors that make these neurons special (reviewed in Nijssen et al., 2017). They tend to innervate only a handful of muscle fibers, as few as five, compared to the 300-2,000 a motor neuron might use to communicate with in the skeletal system. At the same time, oculomotor neurons are unusual in that some form multiple neuromuscular junctions (NMJs) with the same fiber. Plus, they are active more often than many other motor units. “You’re constantly moving your eyes,” Spiller pointed out. The fast-twitch skeletal muscles, ravaged by ALS early on, tend to be used rarely and quickly: 0.2% of a day in the case of a rat, compared to the slow-twitch ones in use up to 35% of the time (Hennig et al., 1984). Some scientists blame the vulnerability of these fast-fatigable motor units on their larger size and membrane surface area, but Hedlund doubts that explanation due to the variability in size within each motor unit type. One thing these vulnerable motor neurons do have, she added, is more dendrites. They also exhibit a higher firing rate, depolarize more slowly, and are less excitable compared to those for slow-twitch muscles (reviewed in Nijssen et al., 2017). A growing number of researchers are trying to understand why certain motor neurons are more vulnerable to ALS. Discovering what makes resistant motor neurons unique could inspire therapies that protect vulnerable ones, too. To investigate this question, scientists are turning to transcriptomics to identify proteins that may help some neurons resist the disease. In a 2010 study, Hedlund’s team discovered more than 100 genes upregulated in rat oculomotor neurons, compared to vulnerable motor neurons innervating the tongue and in the cervical spinal cord. These included the neurotrophic factors IGF-1 and IGF-2 (Hedlund et al., 2010). Furthermore, Hedlund’s group showed that providing the IGF-2 gene to the muscles of ALS model mice protected motor neurons, promoted axon regeneration and re-innervation, and extended lifespan by 10% (see June 2016 news, Allodi et al., 2016). In 2013, a research team led by Pamela Shaw at the University of Sheffield in the UK used a similar approach, analyzing neurologically normal human motor neurons isolated from autopsied tissue. They found in part, 1,521 genes upregulated in ALS resistant oculomotor neurons, compared to spinal cord motor neurons, susceptible to the disease. That included genes involved in synaptic transmission and the removal of glutamate, which may help oculomotor neurons resist excitotoxicity. However, they found no difference in IGF-1 levels, which the authors suggest may be due to species-specific differences. (Brockington et al., 2013). Once scientists identify how these motor neurons resist ALS, they hope to apply that knowledge to develop therapies to protect vulnerable ones from the disease. 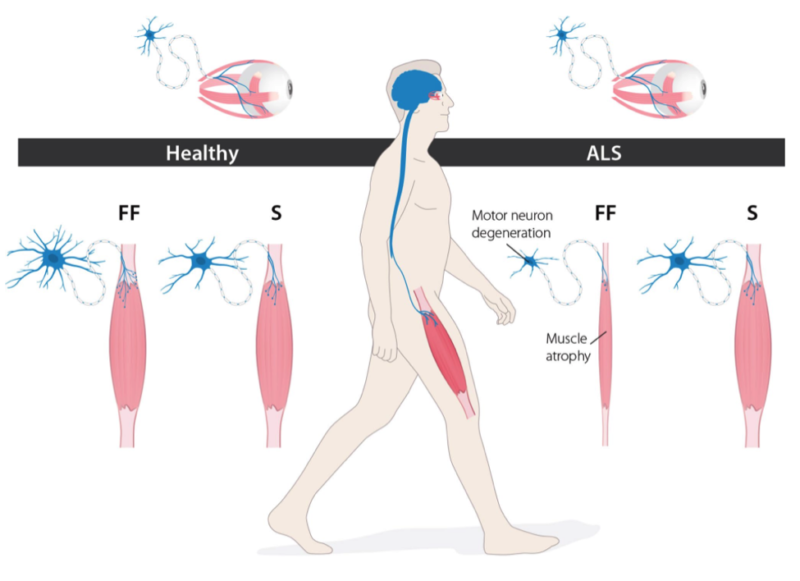 A growing number of scientists are looking to growth factors in hopes of shielding motor neurons affected by ALS from destruction. This strategy might even help resistant motor neurons re-innervate muscles by enabling axons to sprout new connections, according to Spiller (see November 2015 news, Spiller et al., 2016). But one lone growth factor may not be enough to do the job. “You probably need a combination of them,” said Hedlund. That approach is gaining ground. Earlier this year, a research team led by Aix-Marseille University’s Georg Haase in France reported that a set of three growth factors protected motor neurons in the developing lumbar spinal cord – at least in the growing mouse. Their strategy was inspired by studies suggesting that growth factors work together to selectively protect neurons during development as the nervous system comes online. The researchers identified the most effective combination, out of 12 growth substances, by first using FACS to isolate distinct subclasses of motor neurons from the developing lumbar spinal cord, and then exposing them to purified growth factors, singly and in combination, in culture. Alone, each factor helped preserve up to 21.8% of motor neurons cultured for three days. But three together—hepatocyte growth factor, ciliary neurotrophic factor, and Artemin—were the most beneficial, saving half the neurons. The researchers found that each of the triad acted on a different subclass of motor neurons (see April 2017 news; Schaller et al., 2017). The results suggest that a combination of growth factors may be needed to protect key classes of motor neurons in ALS, including those in the cervical and lumbar spinal cord. Haase’s team is now adapting these techniques to look at mature neurons, hoping to inform the development of therapies for motor neuron diseases including ALS. Elsewhere in the US, scientists are gearing up to evaluate Brainstorm’s NurOwn at the phase 3 stage. The strategy, which involves re-engineering patients’ mesenchymal stem cells to produce BDNF, GDNF and HGF, also aims to promote the survival of motor neurons in the disease. But still, many questions about the role of growth factors remain, Haase pointed out: “What are the best factors or factor combinations for the most vulnerable motor neurons in ALS, the motor neurons innervating respiratory muscles?” He suspects neurotrophic factors will garner more attention in the field, particularly for sporadic cases with no option for gene therapy. 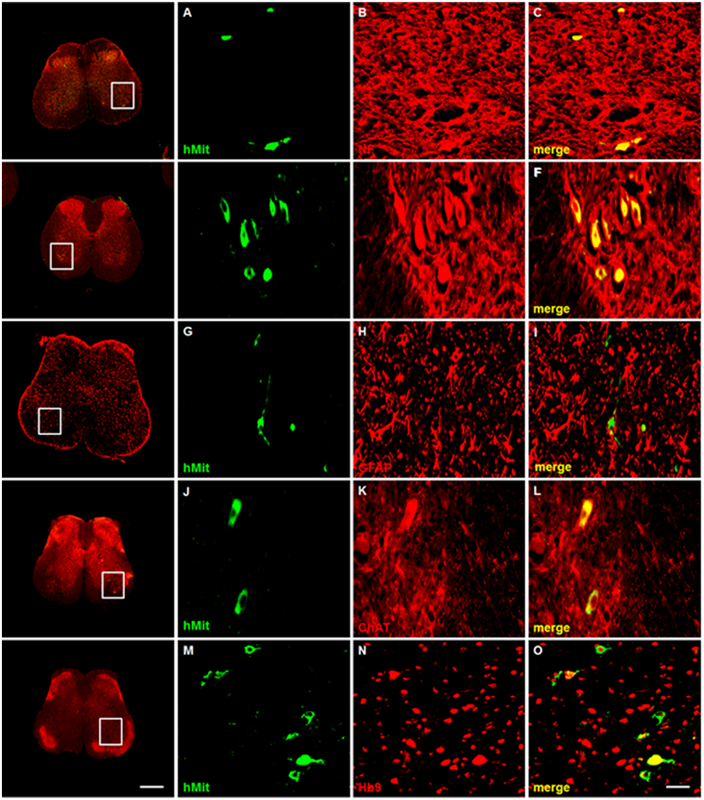 Pun S, Santos AF, Saxena S, Xu L, Caroni P. Selective vulnerability and pruning of phasic motoneuron axons in motoneuron disease alleviated by CNTF. Nat Neurosci. 2006 Mar;9(3):408-19. [PubMed]. Azzouz M, Ralph GS, Storkebaum E, Walmsley LE, Mitrophanous KA, Kingsman SM, Carmeliet P, Mazarakis ND. VEGF delivery with retrogradely transported lentivector prolongs survival in a mouse ALS model. Nature. 2004 May 27;429(6990):413-7. [PubMed]. Storkebaum E, Lambrechts D, Dewerchin M, Moreno-Murciano MP, Appelmans S, Oh H, Van Damme P, Rutten B, Man WY, De Mol M, Wyns S, Manka D, Vermeulen K, Van Den Bosch L, Mertens N, Schmitz C, Robberecht W, Conway EM, Collen D, Moons L, Carmeliet P. Treatment of motoneuron degeneration by intracerebroventricular delivery of VEGF in a rat model of ALS. Nat Neurosci. 2005 Jan;8(1):85-92. [PubMed]. Kaspar BK, Lladó J, Sherkat N, Rothstein JD, Gage FH. 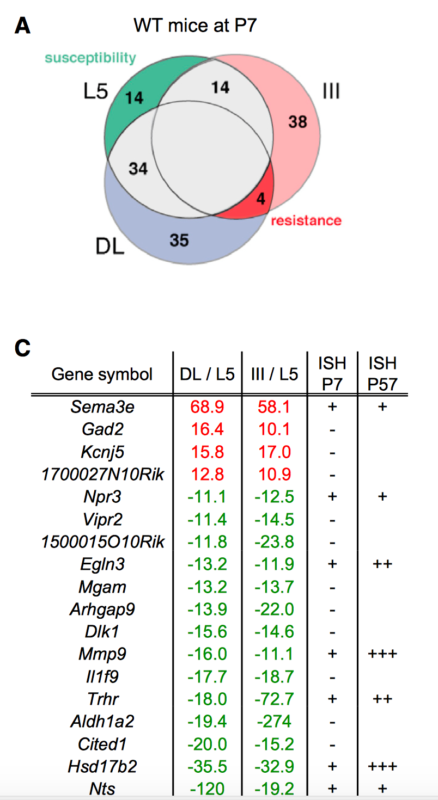 Retrograde viral delivery of IGF-1 prolongs survival in a mouse ALS model. Science. 2003 Aug 8;301(5634):839-42. [PubMed]. Silva-Hucha S, Hernández RG, Benítez-Temiño B, Pastor ÁM, de la Cruz RR, Morcuende S. Extraocular motoneurons of the adult rat show higher levels of vascular endothelial growth factor and its receptor Flk-1 than other cranial motoneurons. PLoS One. 2017 Jun 1;12(6):e0178616. [PubMed]. Hernández RG, Silva-Hucha S, Morcuende S, de la Cruz RR, Pastor AM, Benítez-Temiño B. Extraocular motor system exhibits a higher expression of neurotrophins when compared with other brainstem motor systems. Front Neurosci. 2017 Jul 11;11:399. [PubMed]. Mizutani T, Aki M, Shiozawa R, Unakami M, Nozawa T, Yajima K, Tanabe H, Hara M. Development of ophthalmoplegia in amyotrophic lateral sclerosis during long-term use of respirators. J Neurol Sci. 1990 Nov;99(2-3):311-9. [PubMed]. Kimura T, Jiang H, Konno T, Seto M, Iwanaga K, Tsujihata M, Satoh A, Onodera O, Kakita A, Takahashi H. Bunina bodies in motor and non-motor neurons revisited: a pathological study of an ALS patient after long-term survival on a respiartor. Neuropathology. 2014 Aug;34(4):392-7. [PubMed]. Hennig R, Lømo T. Discharge patterns of presumed FF, FR and S motor units during normal motor behavior in the rat. Acta Physiol Scand. 1984; 121:A28. Nijssen J, Comley LH, Hedlund E. Motor neuron vulnerability and resistance in amyotrophic lateral sclerosis. Acta Neuropathol. 2017 Jun;133(6):863-885. [PubMed]. Kaplan A, Spiller KJ, Towne C, Kanning KC, Choe GT, Geber A, Akay T, Aebischer P, Henderson CE. Neuronal matrix metalloproteinase-9 is a determinant of selective neurodegeneration. Neuron. 2014 Jan 22;81(2):333-48. [PubMed]. Hedlund E, Karlsson M, Osborn T, Ludwig W, Isacson O. Global gene expression profiling of somatic motor neuron populatiosn with different vulnerability identify molecules and pathways of degeneration and protection. Brain. 2010 Aug;133(Pt 8):2313-30. [PubMed]. Brockington A, Ning K, Heath PR, Wood E, Kirby J, Fusi N, Lawrence N, Wharton SB, Ince PG, Shaw PJ. Unraveling the enigma of selective vulnerability in neurodegeneration: motor neurons resistant to degeneration in ALS show distinct gene expression characteristics and decreased susceptibility to excitotoxicity. Acta Neuropathol. 2013 Jan;125(1):95-109. [PubMed]. Shaller S, Buttigieg D, Alory A, Jacquier A, Barad M, Merchant M, Gentien D, de la Grange P, Haase G. Novel combinatorial screening identifies neurotrophic factors for select classes of motor neurons. Proc Natl Acad Sci U S A. 2017 Mar 21;114(12):E2486-E2493. [PubMed]. Sorenson EJ, Windbank AJ, Mandrekar JN, Bamlet WR, Appel SH, Armon C, Barkhaus PE, Bosch P, Boylan K, David WS, Feldman E, Glass J, Gutmann L, Katz J, King W, Luciano CA, McCluskey LF, Nash S, Newman DS, Pascuzzi RM, Pioro E, Sams LJ, Scelsa S, Simpson EP, Subramony SH, Tiryaki E, Thornton CA. Subcutaneous IGF-1 is not beneficial in 2-year ALS trial. Neurology. 2008 Nov 25;71(22):1770-5. [PubMed]. ALS CNTF Treatment Study Group. A double-blind placebo-controlled clinical trial of subcutaneous recombinant human ciliary neurotrophic factor (rHCNTF) in amyotrophic lateral sclerosis. Neurology. 1996 May;46(5):1244-9. [PubMed]. Spiller KJ, Cheung CJ, Restrepo CR, Kwong LK, Stieber AM, Trojanowski JQ, Lee VM. Selective motor neuron resistance and recovery in a new inducible mouse model of TDP-43 proteinopathy. J Neurosci. 2016 Jul 20;36(29):7707-17. [PubMed].